Even accounting for EMRS' habit of overstating the Greens vote by a few points, and the oxygen the Greens have received from the current prominence of a keystone issue (proposed World Heritage Area repeals) I am nonetheless sceptical that the party has recovered even the four points that my interpretation score suggests. Further polling will be needed to confirm whether the apparent surge, to the party's highest EMRS level since August 2012, is even half-real. Some may think that the new purist leadership of Kim Booth has greatly increased the party's support but I don't believe this yet; indeed Booth's own result at the election showed he was hardly immune to the swing against his party. The poll was taken from May 10-14, and as such the sample mostly predates the full unveiling of the federal Budget and the subsequent state response to it. I do not believe results would be greatly different for this state poll if it was taken this week. New governments often obtain a honeymoon effect in which their vote surges to above the result recorded at the election, but this has not happened in this case. It would have been hard to go much above the stellar 2014 election result anyway, but the new government's support level is very likely being dragged down by federal factors, and perhaps by perceptions of an initially impotent response to the Budget (which has since become a much stronger one). Also the party suffered some embarrassment when its attempt to win two Upper House seats unexpectedly backfired with heavy defeats in both. In the circumstances, the Liberals' poll result was to be expected and is neither good nor bad. It is, however, the Liberals' lowest result from EMRS since they last polled 48 back in May 2011. The glory days of being able to oppose a dying Labor-Green government (for a while with help from the same at national level) are gone and now the hard work of holding voter intention at a government-winning level begins. A note that EMRS have significantly altered the presentation of their results, dropping the old table of voter intentions prior to the prodding of voters who were initially "undecided", and now presenting only a table with the undecided rate shown, and a headline table comparable to the results of other pollsters. This is a welcome step because we will no longer see widespread media reporting of a quarter of voters being "undecided" when they are actually not (by the standards employed by other pollsters). On the other hand, it does mean we lose some data about the softness of the Green vote. The current poll shows the Green vote including leaning voters but not undecided voters as 19%. In my experience the actual Green vote may be closer to the unprodded raw figure that EMRS used to publish, than to the figure with "leaning" voters included. However, we no longer see what that unprodded raw figure is. To adjust for this, I will be docking the headline Green vote a minimum of three points, even when Table 2 points to a lower figure. A Preferred Premier table is also presented that shows only Will Hodgman and Bryan Green, and not Greens leader Kim Booth (past EMRS figures included the Greens leader of the time, and tended to just reflect party voting intention). Hodgman's 54:22 lead is not surprising given that a two-way preferred premier score advantages the incumbent, given Green's newness to the job and given the scale of the Liberal victory. If anything it's a relief for Labor that the margin isn't wider. Here are some comparative results for other new Labor Opposition leaders at their first Newspolls against new Liberal Premiers: Andrews (Vic) trailed Baillieu 57-16, Robertson (NSW) trailed O'Farrell 57-13, Palaszczuk (Qld) trailed Newman 55-21, Ripper (WA) trailed Barnett (WA) 60-14. Two of these four Labor leaders have since brought the preferred leader gap down to single figures (anything less than mid-teens is highly competitive). The breakdown by party support not surprisingly shows near-unanimous support for Hodgman from Liberal supporters, while the advantage of incumbency (and possibly Green's baggage collection) sees some Labor and Greens supporters prefer Hodgman. Not surprisingly a high proportion of Greens supporters either don't have a preference, or say neither because they would prefer their own leader. Bright eyes may notice that there were 446 Liberal, 215 Labor and 186 Greens voters in the sample and that the undecided rate was 92, which implies that the overall sample distribution is 49.4% Liberal, 23.8% Labor, 20.6% Green (slightly different to the published figures). The difference is probably down to demographic or by-electorate-sample-size based scaling. What Did The Election Tell Us About EMRS? Unlike the previous few state elections, there was no March EMRS poll, so the last poll EMRS released was in February, over a month out from the election. The party's released polling in February had the Liberals on 50, Labor on 23, the Greens on 17, PUP on 5, Independent on 4 and Other on 0. In the election, the Liberals polled 51.2%, Labor 27.3, Greens 13.8, PUP 5.0, Ind 1.3 and others 1.4. So the EMRS poll did far from badly given how far from the election the poll was taken. Furthermore, to the extent that the poll was wrong, it was wrong in ways EMRS had been wrong at prior elections: overestimating the Green vote, understating Labor, while getting the Liberal vote more or less right. My interpretation of the poll corrected it to 50-26-15-6-3, which ended up being very close to the election result, and actually closer to it as concerned both Labor and the Greens than my final aggregate. The interpretation method I'd been using for some time was to give none of the EMRS undecided vote to the Greens, and split it about evenly between the major parties. While it's more difficult to read things into comparisons involving a poll last taken over a month from election day, it's likely that there was not much net change in real voter intention between the February EMRS and the state election. I believe there was a move from Labor to the Greens then back again, and that the reason for the late swing back was that voters on the left became scared of poll results that implied the Greens could become a co-Opposition or even if very lucky Opposition in their own right. After all either of these things would have been seen to (and very probably would have) guaranteed the Liberals victory in 2018, and it was a mistake for the Greens to play up these possibilities to the extent they did. That said, the estimates of the Labor and Green votes in my final aggregate were also a little out of whack because (i) the final Newspoll was unusually inaccurate on the Labor vote, getting it wrong by more than 4 points (ii) I'd rather underestimated the lean to the Greens in ReachTEL's state polling, which if anything may have increased with a method change that came in in early 2014. All the pollsters working here, not just EMRS, have the Green vote too high. It's time to start a new aggregate of Tasmanian polling, noting that for this cycle I will be making some slight methods changes to apply harsher corrections to the Green votes of pollsters other than EMRS. For the time being that doesn't matter since the only data sources for this aggregate are the EMRS poll and the state election. For the starting values my method is simply to apply the swings in my "interpretation" score to the state election result. As noted above I don't really believe the Greens are on even 18 let alone 21 but the idea of an aggregate is to accumulate objective data and not subjective scepticism. The above (click for larger version) is what the EMRS poll would look like if the implied swings (as corrected for house effect) were applied to each seat uniformly. 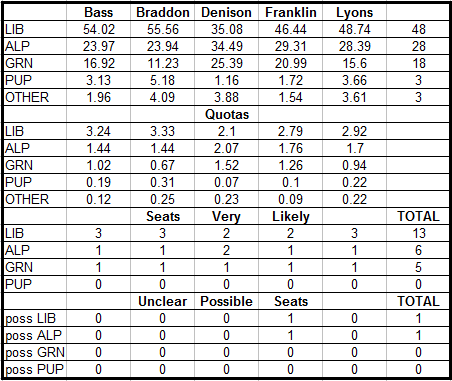 Bass, Denison and Lyons are all straightforward with the Greens recovering a seat from Labor in Lyons. In Braddon, leakage would leave the Liberal vote too low for much chance of pulling a two-candidate squeeze trick against the Greens like the one they pulled off against Brenton Best, while Bryan Green would probably (as Opposition Leader) so dominate the Labor ticket as to put them out of the race, so the Greens would probably win that one. In Franklin the Liberals would probably lose a seat to Labor because of greater vulnerability to leakage and unfriendly Green preferences. Thus the most likely result based on this poll is 13-7-5, and not much of a swing from these results would be needed to remove the third Liberal seat in Lyons. As the aggregate result is based on only one poll and the election at this stage I've decided to wait until a second poll is included before posting it in the sidebar. PS: The 35 Seat Question: I doubt a 17-member government will have much need to think about expanding the size of parliament but in any case I've updated my 25 or 35 seats article from last year with modelling of what would have happened at last year's election under the old 35-seat system (19-11-4-1 or 20-11-4 for those in a hurry.) My reading above of the current poll would translate to 17-19 Liberal, 10-11 Labor and 6-7 Green in such a system, but only if the Green vote was really as high as 18. "I believe there was a move from Labor to the Greens then back again, and the reason for the late swing back was that voters on the left became scared of poll results that implied the Greens could become a co-Opposition or even if very lucky Opposition in their own right. After all either of these things would have guaranteed the Liberals victory in 2018, and it was a mistake for the Greens to play up these possibilities to the extent they did." A bit beyond your brief as a psephologist, maybe? Mighty fine work otherwise thanks for the analysis. I've added the word "that" before "the reason". - The Green vote rose during the campaign: there is fairly strong evidence for this based on a series of ReachTEL findings using the same methods of 15.3%, 17.1%, 18.2% (Jan 24, Feb 13, Mar 6). Admittedly the first was a Liberal commissioned poll but I don't see any reason not to use it as it is consistent with other results around that time. - The Green vote fell at some time between when the Feb EMRS was taken (Feb 5-8) and the election: based on the ReachTEL findings above the only alternative to this is that ReachTEL had a house effect of something like 4 points in the Greens' favour. I've not seen anything in other ReachTEL polling (including by the same methods) to suggest it would have been quite so high. Again, not conclusive, but suggestive. - As to why the Greens' vote fell: here I am hypothesising (hence the use of "I believe" rather than a firmer way of putting it) but I do believe it is the within the brief of any analyst to generate hypotheses. That includes hypotheses for which a method of testing might not be immediately apparent (as in this case), so long as they are not passed off as facts. That said I'm not alone in this sort of view of the tactics used and have sometimes heard experienced party insiders lament that the pre-hyping of party results raises expectations but not vote share. - Green opposition or co-opposition would have guaranteed Liberals victory next time: it actually doesn't matter to the point I was making whether this is necessarily true or whether it would have just been seen to be true. I've edited the wording there a bit too.